“How long did you say I was going to be here?” I asked. After giving me a steady look for a moment, he chuckled to himself and handed me another twenty. I turned around and looked up at the towering two-floor bookstore. One would have thought I was in a toy store by the way I was acting. A bundle of excitable and nervous energy, I jittered about and whispered exclamations to myself. But where to begin? With all that was presented to me, it was almost impossible to know where to start. Quickly, I ran through titles in my head. 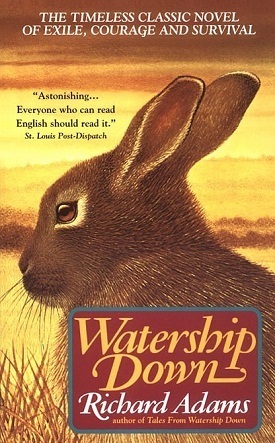 I remembered Watership Down, a book that one of my best friends at the time was reading, and dashed off to find it. Even today, when I go to a bookstore or a library, I always find an author or title that I know and use it as a touchstone. I browse at the peripherals and continue in an outwardly expanding search pattern as a way of discovering new books. With Watership Down now firmly in my grasp, I march to the check out counter and make my purchase. I then realize I had just under four hours left to wait for my grandfather. Rather than sit down to start to read, I then tried to think of other books. My mind landed on a series of books that my mother read called Merlin’s Legacy. I found the series and decided to purchase a few for my mother – besides, I had the money for it! Now, looking back, I do think it a bit strange for a pre-teen to purchase multiple Harlequin Fantasy Romance novels… But I digress. Long story short (too late): The point is I bought Watership Down. Now, over 15 years later, and after three incomplete attempts, I have finally finished the epic rabbit tale. Was it worth the wait? I will say that I do appreciate what Adams wrote, but perhaps more so because Watership down has become somewhat of a literary reference in other works I’ve encountered. Whether it’s Stephen King’s Dark Tower Saga (with references to Adams other bear tale, Shardik) or picking up on little Easter eggs in Lost (Ha! Because they’re bunnies!… See what I did there? ), I can feel like I have crossed a milestone that was long overdue. Sort of like going back in a video game to make sure you collect everything from a certain level. I will say that after all these years, I suppose I expected some kind of epiphany from completing the novel. Thanks to all the years of the book sitting on my shelf, staring me down. Now all the discussions with high school friends and their favorite books are simply a distant memory. Perhaps I should consider this book a ghost that has been haunting me for a decade and a half, but that casts such a negative light on it. I did enjoy Watership Down, but I find myself wondering what else there is to comment on. Though the rabbit folklore was interesting, I sometimes wondered what the purpose was… the parallels were loosely suggested between the crafty rabbit El-Ahrairah and the noble leader Hazel… But I did find myself saying, “Okay…. so what?” Maybe my age is making me more skeptical. I could just accept this as a wonderful story about rabbits… or perhaps I should try watching the cartoon next. I heard that scarred resonated with so many.